The longest commutes are endured by people in low-income neighbourhoods in the suburbs. The bus fare doesn't begin to represent the true cost of the commute. Everyone complains about congestion in Toronto. And not without merit — the city is one of the worst in North America for commute times. But as the recent City Institute study claims, the longest commutes are endured by people in low-income neighbourhoods in the suburbs. The bus fare doesn't begin to represent the true cost of the commute. Oladipupo exemplifies the transit woes of many in the suburbs. His daily commute is even longer than average: two hours, each way, every weekday. "I live in Scarborough, so the closest intersection is Finch by Morningside," he told Metro Morning. "Then I take bus 39b which runs from there to Finch subway station." At Finch, Oladipupo doesn't get on the subway. 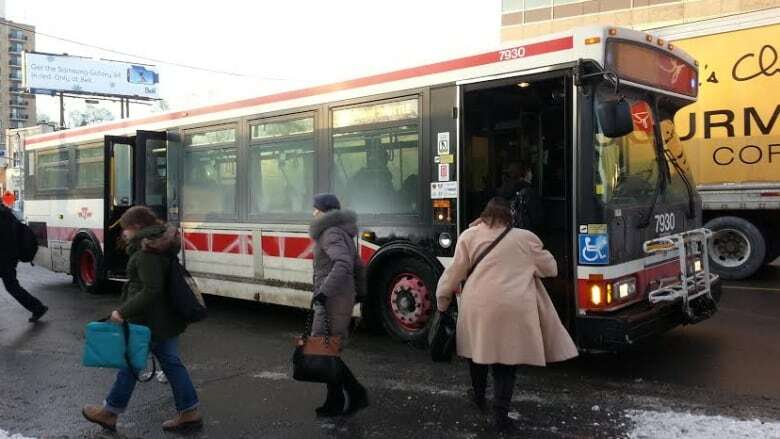 He boards yet another bus to get to his job at Islington and Steeles. He travels between suburban neighbourhoods where people rely on circuitous east-west bus routes every time they leave the house. It's a daily trip so exhausting it's making Oladipupo sick. "I was beginning to have migraines, you know," he said. "At times when you miss the bus or the bus is not running on time, you have to be out there [at the stop]. I get so tired." He carries a backpack, which, depending on how long the commute is on a given day, gives him back pains. "It's hell, going from work to home," he said. Being on a bus for a good portion of the day makes even routine tasks difficult. Sometimes Oladipupo gets home so late, and he's so tired, bed is the only option. He can barely carve out the time and energy to pack a lunch for the next day, he said. So what can alleviate this situation? SmartTrack, the near-single focus of John Tory's election campaign. SmartTracker is the app that lets people figure out for themselves what difference SmartTrack would make to their commute. Through the app, Oladipupo figured out the new line would cut his commute in half. That's two extra hours off the bus for him — a game-changer. But SmartTrack has yet to be approved by city council. It's at least seven years away. That's seven years of daily crushing daily commutes for Oladipupo and many others. He can't wait that long. He has to move, he said, if only for his health. But his commute is even messing that up. He finds himself not being able to get to appointments to look at units because the bus takes so long. "I was really getting nauseous on the bus. Quitting the job was not an option, it's a lovely work environment and I'm so happy doing the work I'm doing," he said. "So I kept on managing the situation." As a newcomer and recent refugee, Oladipupo was overjoyed to get the job at a non-profit agency in North York doing community work, much like the work he'd done in Nigeria. In Nigeria, he had perks few others enjoyed. But in a country where corruption and bribery are also part of many government jobs, Oladipupo made some dangerous enemies, he said, by refusing bribes. There were death threats from people used to getting government jobs. He came to Canada and applied for refugee status. He's been here for about a year. He does not want his last name to be broadcast. Finally, through a coworker connection, Oladipupo has been able to find a basement apartment closer to his work. It's a relief. Everyone in Toronto pays the same fare. But there are other costs — time and health — that are seldom factored in. Oladipupo isn't paying that price any more. But thousands of people living and working in low-paying jobs in both the 416 and 905 suburbs keep paying it, every single day.